A new study by a team of researchers led by Jessica Hellmann, assistant professor of biological sciences at the University of Notre Dame, offers interesting insights into how species may, or may not, change their geographic range — the place where they live on earth — under climate change. The lead author on the paper is recent Notre Dame doctoral degree recipient Shannon Pelini. Researchers have hypothesized that populations near the northern boundaries of geographic ranges in the Northern Hemisphere would be pre-adapted to warming and thus will increase with warming, facilitating range expansions. However, the assumptions underlying this theory have not been previously tested. If these northern populations do not increase under warming, species may not track changing climatic conditions and instead decline under climate change. 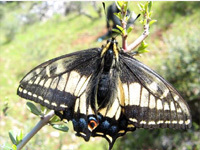 In a paper appearing in this week’s edition of the Proceedings of the National Academy of Sciences (PNAS), Hellmann and her team describe how they tested the assumption that populations at the northern edge of a species’ range will increase with warming and thereby enhance the colonization process by using two butterflies: the Propertius duskywing and the Anise swallowtail. Hellmann notes that butterflies serve as a kind of flagship species for studying the effects of climate change. They live and die relatively quickly and researchers have garnered a substantial amount of information about them and their habits. Insects in general are important subjects for climate studies because of the key role they play in areas such as pollination and the cycling of nutrient in ecosystems. Hellmann pointed out that by comparing and contrasting two distinct butterfly species in the same geographic area, researchers can obtain general principles to help predict if species will change their geographic ranges under climate change. Hellmann and her colleagues found that populations at the northern range edge in both butterfly species experienced problems when exposed to warmer conditions — the conditions that they will experience under climate change. The duskywing performed well in the summer months, initially suggesting that populations could increase with warming conditions. However, it performed poorly under warmer winter conditions, which would likely offset the summer population gains. Additionally, range expansion of the species is inhibited by the lack of host plants. Northern populations of the swallowtail did not benefit from any of the warming treatments. The species fared badly during heat waves occurring during the summer months when tested under field conditions and fared no better under conditions of steady, moderate warming in the laboratory. Temperatures at the northern edge of the geographic range also impacted the host plant the species relies on, implying that interactions among species could change under climate change. The results shed doubt on the assumption that populations near the upward range boundary are pre-adapted to warming and will increase with upward range expansions and this paper is the first based on experiments to say so. Other authors of the paper include Jason D.K. Dzurisin, Kirstin M. Prior and Travis D. Marsico (a recent doctoral degree recipient currently at Mississippi State University) of Notre Dame’s Department of Biological Sciences; and Caroline M. Williams and Brent J. Sinclair of the University of Western Ontario’s Department of Biology. Managed relocation, also known as “assisted migration,” has emerged as a possible means of preserving species endangered by rapid climate change and other environmental threats. The concept involves picking a species up and moving it potentially hundreds of miles to a place thought to be more accommodating, but which is outside of the species’ native range. Hellmann, and fellow Notre Dame researchers Jason McLachlan and Alejandro Camacho were among the authors of another PNAS paper last month that described a ground-breaking tool designed to help policy makers assess potential managed relocations. The latest managed relocation PNAS paper suggests some issues, such as unexpected impacts on the relocated species and the creation of further environmental problems, that scientists and policy makers will confront in considering managed relocations. The research was funded by the U.S. Department of Energy’s Program for Ecosystems Research (http://per.ornl.gov/).